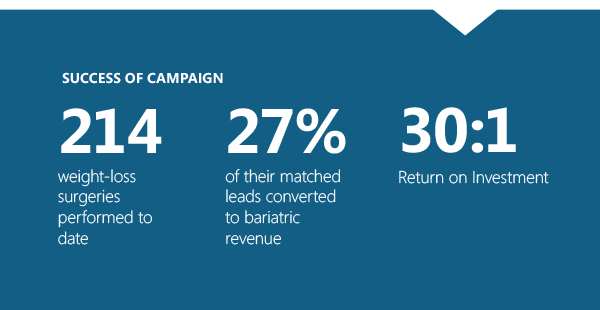 In 2016 a medium-sized health system client of Medicom’s tasked their marketing team with growing bariatric surgery revenue. For a long time, the system had relied heavily on traditional outreach to drive attendance to their bariatric surgery seminars. With limited success, the marketing team realized the need to increase online engagement, personalized outreach, and seminar attendance in order to reach their increased surgery revenue goals. In looking at Medicom’s Weight-loss HRA, (which determines if consumers are appropriate candidates for surgery) and hearing about other successful campaigns we have run in conjunction with this client’s CRM, they decided to run a campaign dedicated to promoting the HRA via primarily Facebook. The client understood the value of placing an HRA as a strong a call-to-action for their digital campaign. Since weight is a sensitive topic in healthcare, allowing consumers to voice their concern and communicate about their weight issues was a driver in selecting Medicom as a partner. They also knew the importance of having appropriate follow-up in place, so that consumers knew how to access the care they desperately needed. By taking advantage of Medicom’s calls to action, follow-up email system, along with their ability to facilitate phone call follow-ups, the system was well armed to engage consumers and encourage action in the service line. From January 2017, through the end of July 2017, 340 consumers completed this client’s HRA, reflecting a 54% completion rate for the client, compared to the 35% client average. Of the 340 completions, 68% of those consumers were recommended for weight loss surgery, compared to 53% client average. The effort yielded a significant increase in seminar attendance, and to date, has generated a whopping 214 surgeries and an ROI of 30:1.